In a long while, we sometimes come across change-makers in society from simple unassuming persons. This is a story of a few hitherto unknown persons who collected bits and pieces of discarded waste items from Marten Dumping yard to fend for themselves and their families. They collected all items that may have some economic value and stored them and sold to scrap dealers for a price. The daily routine of rummaging the city’s waste to pick up different items of little value goes on throughout the year. They must often work with their bare hands with little or nothing to protect them from imminent health hazards. These women have come up the hard way who worked tirelessly for hours to sustain themselves and their families. They are still grateful for the meagre income they get from the recyclables they manage to pick and sold them for a mite. Members of Iainehskhem Self-Help Group (SHG). Under the North Eastern Regional Capital City Development Investment Programme (NERCCDIP), State Investment Planning Management and Implementation Unit (SIPMIU), urban affairs department and SMB have developed a plan to rehabilitate the women and facilitated the formation of the Iainehskhem Self-Help Group (SHG), in November 2014 with the objective to enhance the livelihood of women waste pickers. The group has become a replicable model for villages and town colonies where decentralised waste management can be implemented. After getting trained the women group has shown that they can make full use of their learnt skills. The members of the SHG became cohesive after much hand-holding and training organised by the Community Team of the NERCCDIP. The group has framed their own rules and regulations and it has become cohesive with a strong Team Spirit. They truly uphold the dignity of labour and happily go about their work of composting, so much so they have come to be known as “Merry Maidens of Marten” for their sense of happiness, unity, and cooperation. Slowly their interest in making use of the waste item emerged through a few training sessions that were organised for the members. They have started monthly saving from the meagre income they get from waste picking. 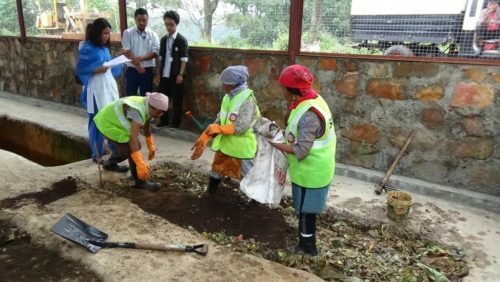 They have launched a project to compost the biodegradable waste with a simple indigenous technique of composting. 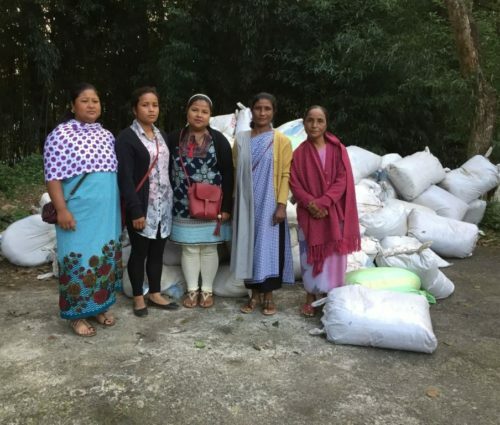 Through the constant encouragement from SIPMIU staff and the simple technology shared with them by Bethany Society (NGO), these women have become champions of green economy and green-jobs. The SHG has already produced about 7000kgs of compost manure that was tested by the Department of Agriculture Laboratory and certified that the manure is good for plants. Another test from the ICAR laboratory has re-confirmed that the organic manure is suitable for plants. The compost products are produced from an indigenous Trench Composting technology, perfected by the SHG, is a FIRST in the North Eastern Region. The first step in trench composting, once the waste is delivered to the unit, is secondary segregation. Although the waste is segregated at source, there are traces of non-biodegradable waste. The members remove non-biodegradable waste through careful secondary segregation. Once completed, and the waste is spread evenly, topsoil is added along with Garbage-to-gold (G2G) granules and LAB. The waste is then turned to mix all the ingredients. The division of labour is organised that a few members are engaged in part one, a few are getting the trench ready by adding the topsoil and G2G granules at the bottom of the pit and a few in transporting the waste to the prepared trench/pit. After every six inches of waste, top soil and G2G granules are added again before the next layer. This process is repeated until the trench pit is full. After forty-five days, the compost is taken out from the trench and piled to the one-foot big heap for further fermentation (Bokashi Composting). This is left for two weeks, every alternate day the compost is mixed for aeration. Aeration is necessary to cool down the compost because if there is too much heat, the microorganisms will die, and fermentation process will slow down. Come the second week and compost is spread evenly on the floor for drying. After a day, the compost is sieved, put into packets, sealed and ready for sale. SHG members engaged in the process of composting. Having worked wholeheartedly for over eight months and produced 10,000kgs of compost (300 odd bags of 30kgs each), the compost was not being marketed. On the 22nd June 2017, with the support of Bethany Society, two SHG office bearers and the CPPA team visited the Raj Bhavan (Governor’s Residence) with the intention to sell the ready compost. Having met with the Deputy Secretary who introduced the team to the Principal Secretary, the story from waste-pickers to Merry Maidens was shared and the Principal Secretary was very impressed with the work carried out by the SHG members. He immediately placed an order of 7000kgs of compost at the rate of Rs 15/kg amounting to Rs 1,05,000/-. This icebreaker was long awaited, and the members were ecstatic. From then on, the Group has been supplying compost to Raj Bhavan Gardens. Again, there was a demand for another 4000Kgs of compost which was packed and delivered after receiving a supply order. The Principal Secretary has assured that Iainehskhem Self Help Group will be the sole supplier of compost to Raj Bhavan. The Agriculture Officer-in-charge of the Raj Bhavan Gardens has given an impact report that the compost supplied by Iainehskhem SHG is of superior quality. People are beginning to recognise the work of the members of SHG and have nothing but praises and goodwill for each member. The word is spreading, and people are getting in touch with the group for compost. The group is now trying to knock at the doors of the Agriculture and Horticulture Department. Glance of a training session of members of SHG by Mr. James from Bethany Society, Shillong. Every day is a new learning experience for each of the members. Three office-bearers- President, Secretary and Treasurer, also Vice President, Assistant Secretary and Assistant Treasurer, head the group to ensure sustainability of the group. The members who have faith and trust in their working have elected these leaders. The group take ownership by framing their own constitution/rules, which all members are expected to follow. The constitution mandates the members to enforce, monitor, penalise and charge fines to non-complying members. All members contribute a monthly subscription to have ownership of the group. Composting of biodegradable waste is a daily norm for alternative livelihood for weaker families. This process can be replicated to manage waste going to the landfills. This system of utilising waste can be done in the neighbourhood and at institution levels in small scale. The Iainehskhem SHG has shown the way and they truly deserve to be appreciated by environmentally conscious people and organizations. The SHG not only makes compost and markets it but are now confident trainers and confidence builders. Guest-post by Iainehskhem Self-Help Group, Shillong. This is amazing. I will love to learn more about how I can create a similar system in rural communities here in Nigeria. Most of these communities have lots of farm waste that can be utilized for creating compost. I work in rural communities here in Nigeria through my organization called Durian. Our mission at Durian is to empower rural communities become self-sufficient through transforming their local waste into value. I will be very glad to learn more.